It is a great thing to be an entrepreneur; it is even better to be an entrepreneur who can make a difference in the world. That’s the goal of the 10 teams of innovators who spent their summer at the Connecticut Center for Entrepreneurship and Innovation (CCEI), refining and strengthening their start-ups. They presented their business plans to a group of judges on Aug. 2 at the Graduate Business Learning Center in Hartford. David Nichols, a Ph.D. candidate, and his team, have a new approach to teach math to struggling college students. Their SAVKAR.AI is already drawing interest from every community college in Connecticut. It peppers students with practice in areas where they need it, but doesn’t waste their time with concepts they understand. Successfully completing a first college math class improves the odds of remaining a STEM student, where they can address complex issues like clean water and non-addictive painkillers, he said. Armin Tahmasbi Rad, a Ph.D. candidate, and his team have found a better way to identify cancer treatments that will succeed. Their Encapsulate technology would allow doctors to grow tumors from biopsied tissue and test treatments in the lab, potentially sparing patients weeks of guess work and unnecessary medication. “Working together, cancer is just a word—not a sentence,” he said. Elizabeth Johnson, a graduate student in the College of Agriculture, and her team have found a vaccine-free method of keeping cattle healthy called MycoZap. Cattle in a transport vehicle share germs like kindergartners in classroom, she said. By treating them with a special salt, farmers could prevent a host of serious infections and save a great deal of money, she said. Daniel Yasoshima ’18 and his team invented YouComm, a sophisticated new patient communication system for use in hospitals. The app would allow people who are immobilized to call for help and give nurses additional information about the nature of the request. He first thought of the idea as he watched his grandfather seek care during a series of hospitalizations. Other inventions included WickAway, a device that would automatically snuff out candles to prevent house fires; QRFertile, an inexpensive, at-home male fertility test; Dyadic Innovations, technology for troubleshooting issues for nursing moms and their babies; WellTech, a program to allow busy doctors to quickly identify at-risk patients; Snipit, a music-discovery program, and Spore, a mushroom-growing business serving exclusive restaurants. “This year’s Summer Fellowship teams are quite impressive, and it is so exciting to see how they have developed their concepts over the eight-week fellowship,” said Tim Folta, faculty director of CCEI, adding that he was pleased with the diversity of teams, representing schools and colleges from across UConn. Participants ranged from undergraduates to faculty to Ph.D. students. All of the start-ups have the ability to become viable businesses and impact society, he said. Each team was awarded $15,000, access to professional services and seven weeks of business training. This is the third summer UConn has offered the program. 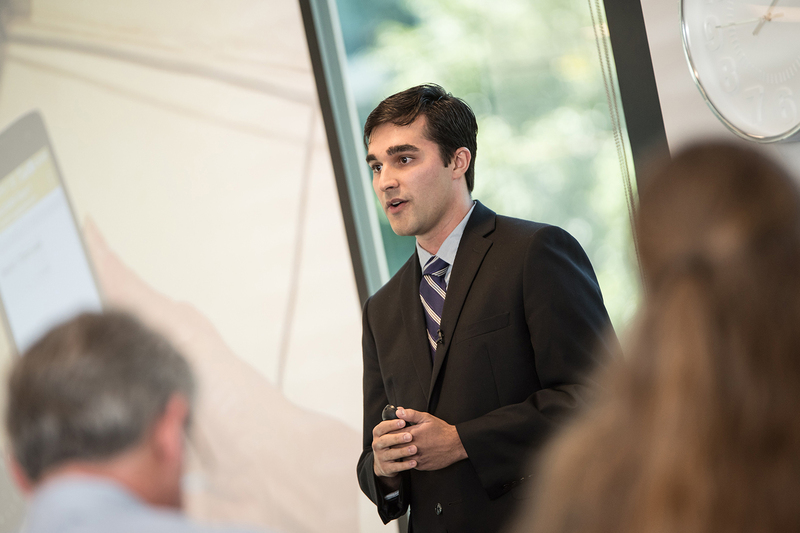 Five of the start-ups, including SAVKAR.AI, WellTech, MycoZap, QRFertile and Encapsulate, were selected to move onto another entrepreneurship program in the fall, the Wolff New Venture Competition. The competition is named after Gary Wolff‘s parents, and he served as a judge in the August competition. Jen Murphy, program manager at CCEI, said the program invited 20 teams to pitch for a slot in the Summer Fellowship. The Summer Fellowship Finale is a major milestone in the evolving entrepreneurial ecosystem at UConn, said School of Business Dean John A. Elliott. “We celebrate the full engagement of so many in support of the 10 finalists who have refined their entrepreneurial ideas so effectively and progressed toward commercialization,” he said. Trevor Svec‘s WickAway candle extinguisher didn’t place among the top five, but the recent School of Engineering graduate said the Summer Fellowship had helped him with a timeline and a plan to move forward. “The program sets you up with a network of resources to access. I’ve got some traction. People helped me past the ‘pain’ points and made it easier to move forward,” he said. Svec said UConn has supported him from the time he was a freshman, walking in determined to start his own business. From clubs to an IDEA grant to mini innovation-pitch sessions, he said he grew more knowledgeable and benefited from UConn resources.